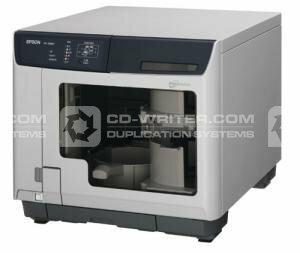 The desktop CD/DVD disc publisher you can rely on is here, Discproducer from Epson. Built with Epson's advanced robotics and printing technologies, this compact, professional disc publisher has all the features you need to get the job done. It is designed to burn and print up to 100 customized CDs or DVDs on demand. And, with one set of high-capacity ink cartridges, you can create over 1,000 discs. Discproducer also features a built-in 6-color inkjet printer, with Epson's MicroPiezo technology, that delivers the highest print quality available for crisp, clear text and vibrant graphics. And our Total Disc Maker software lets you format data, edit labels and control the production process all in one easy-to-use application. Best of all, Discproducer comes with the quality, reliability and service that Epson is known for. Whether you need to burn and print a few CDs or DVDs at a time or up to 100, Epson's easy-to-use, feature-packed Discproducer is the answer. It's ideal for a wide range of businesses and organizations, from duplication service providers, schools and universities to professional photographers, kiosk applications and corporate communication centers. With its rugged, compact all-in-one design, dust-proof case and minimum number of moving parts, Epson's Discproducer delivers high performance, fast throughput and top reliability. Its robotic arm with AcuGrip technology virtually eliminates two-disc feeding that can damage discs and interrupt unsupervised production runs. In addition, everything can be quickly accessed from the front of the machine for easy operation and maintenance. The Epson Discproducer features a built-in Epson inkjet printer, with Epson's patented MicroPiezo technology. Using six colors instead of the common four, it delivers the highest print quality available in its class for crisp, clear text and vibrant graphics at up to 1440 x 1440 dpi resolution. And with just one set of high-capacity ink cartridges, you can print over 1,000 discs. * In addition, ink level status is shown with an LED readout for each color to prevent printing without ink. Epson's comprehensive Total Disc Maker software lets you quickly compile your data, create labels and configure the production process all in one easy-to-use application. It also includes a program that displays the status of all jobs and devices and a bridge tool that allows you to communicate with other applications. See the Epson PP-50 Disc Producer here. Epson . PP-100 . DiscProducer . II . USB . EPSON .